Each year, the Page Center funds a select group of research projects as part of its Page/Johnson Legacy Scholar grant program. While focus areas differ from year to year, the Center aims to support research that fosters an understanding of the Page Principles and Johnson & Johnson Credo, two philosophies that promote ethical decision-making in public relations. 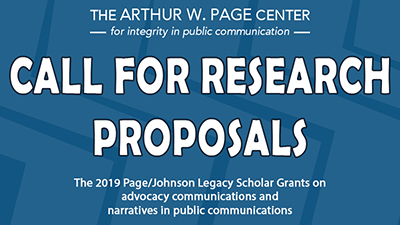 For its 2019 call, the Center is seeking research proposals that will contribute to the scholarly and public understanding of advocacy communications and narratives in public communications. Visit the 2019 Call for Proposals page for more information on both calls. Application materials must be electronically submitted by Jan. 15, 2019. Scholars will be notified of the selection committee's decisions by March 15, 2019. All areas of advocacy will be considered, but areas of public health and social justice will be prioritized, particularly those studies focused on communications-driven behavior change and social mobilization. Research can focus on communications in both the digital space and in legacy media. Click here for guidelines on submitting your proposal.